Is she ready to become a hero? She can wear this girl's Miraculous Ladybug costume and become her favorite Nickelodeon character instantly. Whether she wants to help defend Paris from the most nefarious villains around, or just wants to party as a fun and colorful character, this costume will let her become the animated character with ease! This costume captures the cgi animated look of superheroine Ladybug perfectly. 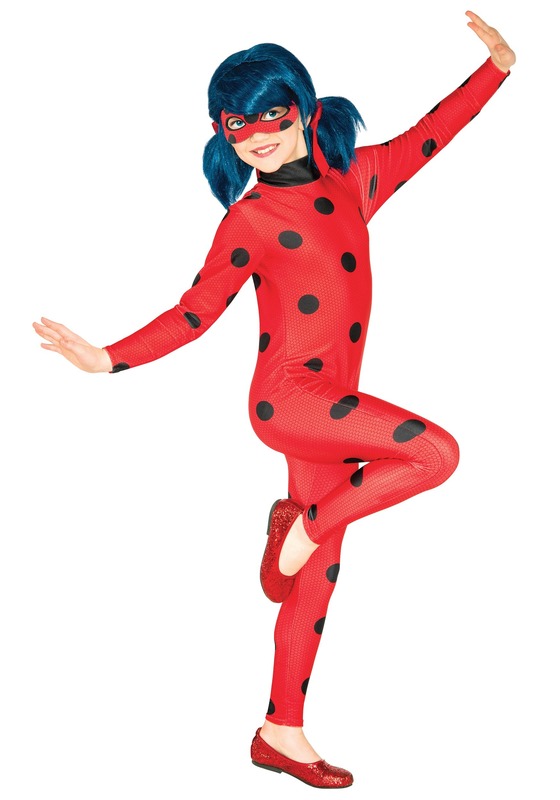 A black spotted red jumpsuit is all it takes to turn Marinette Dupain-Cheng into her super alter-ego, so we think this costume suit will do the same for your little girl. With included eye mask, she'll be able to hide her real identity and start fighting crime in style. Add the signature blue hued wig (sold separately) to complete this officially licensed costume look, and coordinate her with a friend to get Ladybug and Cat Noir teamed up on the scene. With these two Parisians on patrol, your neighborhood is sure to be just a little bit safer! Great costume!! My daughter LOVES it!! She wears it all the time and pretends to be Ladybug. It's soft and flexible and fits great!! Suit is cute but wig is way too small. My 8 year old daughter is devastated because the wig doesn’t fit at all, leaving the costume quite useless in her opinion. Disappointed.